We have been busy the past month with the Ugly House renovation. We have the ceilings done, the floors are going in (sneak peek of the floors below!) and the trim is all picked out. 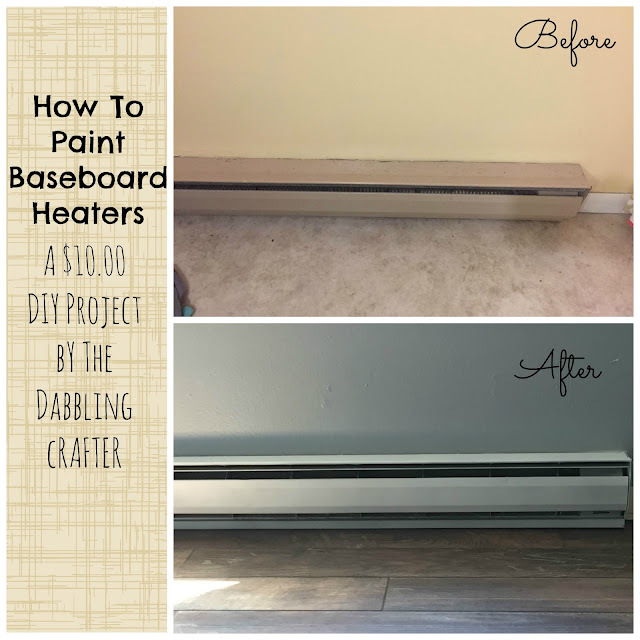 One minor project we had to finish up before we started on floors was painting our baseboard heaters. They aren't exactly the most attractive part of our house, but with a limited duct system, they are necessary. We spoke about replacing the units as a whole, but they work very well. They just aren't all that attractive in their "retro" beige color. You know it, that almond color that infested homes of the 70s and 80s. We knew with the new tall white trim we have picked out, the beige baseboards would stand out even more. I started to research how to paint them. Turns out high heat spray paint was just the ticket. (Disclaimer: always use your own judgement and/or seek the judgement of professionals before you attempt to paint or mess with anything like a baseboard heater or anything of the electric variety). Now, our heaters don't get all that warm themselves, but of course I wanted to be on the safe side. I've used high heat spray paint on several other projects with success including a firepit and a stove. Both times the paint held up surprisingly well. I'm hoping for the same with our heaters. Originally, I thought I could remove the cover from the heater and paint that separately outside. Our particular heaters don't allow you to remove just the cover. So, I had to paint them while they were inside. Before preparing to paint, you have to prepare the surface for paint. That means a good cleaning, light sanding and another cleaning. Next you have to tape off around the heater (thankfully I didn't have to tape off the floors because they were removed at the time). I used heavy duty contractor paper and painters tape. I also had to cover everything in the room in case there was any sort of crazy over spray. Finally, spray painting indoors is less than ideal. So, there was a heavy duty mask involved and lots and lots of windows open to add as much ventilation as possible. The high heat spray paint doesn't cover particularly well, so it took quite a few coats to cover each heater. I think I went through a total of 3 cans for three baseboards of varying length. So, the total investment was around $9.00 for three like new baseboards. Great change for a little bit of elbow grease.